Mahindra sold just over 56,000 units in February 2019 as against 51,127 units in the same month last year with a growth of 10 per cent. Mahindra & Mahindra has announced its monthly sales numbers for February 2019 and the outcome as expected has been impressive. 56,005 vehicles, With 56,005 units sold compared to 51,127 units during February 2018, an appreciable growth of 10 per cent has been achieved. This thought made my day!! After sifting through numerous cars over nearly 3 years, this one's features were the most appealing. And if it indeed is a premium product (thanks for saying so ) it adds weight to my choice. Have you booked the XUV? If yes then which colour? I test drove the XUV diesel variant and it was really smooth. I'm not an experienced driver or someone who knows alot about engines and stuff, but from an average driver point of view, the car is a joy to drive. It was pretty silent throughout and the pickup was decent. It handled the bumps well and the car is really powerful. I enjoyed driving a car after a really long time. In comparison, I also test drove the S cross. The pickup is very poor and found the interiors noisy while driving. I've driven petrol since the start and currently drive a 2013 Honda Amaze. The difference in driving the XUV and s-cross was alot I feel. Also, the XUV gave me a very premium feeling as soon as I sat inside the car. They could've definitely priced it a bit lower but I believe it's a good car overall. My parents didn't like the Nexon so couldn't test drive that and I personally don't like its back. Same with EcoSport. I found the interiors of the XUV premium. I'm planning to book the car soon. Which colour do you all find the best looking? I have came across few people on the internet and also in person who had previously booked XUV300 or were planning to buy one (including myself) but due to its high price tag, they've cancelled booking and chosen Nexon. Anyone here who has done same? And is it possible to get discounts on a brand new car within a month of its launch? Also, its MID is locked at 12.0 kmpl so we can't know the actual fuel efficiency if it's below 12.0 kmpl What team-bhp members think about its high price who have driven it? After driving it, do you see it as a value for money car or slightly overpriced? In comparison, I also test drove the S cross. The pickup is very poor and found the interiors noisy while driving. For all practical reasons, I think S-Ccross is dead, unless they bring the 1.5d , I don't think anyone would buy the Scross. Quality and finish of XUV 300 is better than an S-cross, however, for the money I would settle either for a Nexon or Ecsoport . The S Cross anyday, it is a superior car in most respects, if you manage to get a well maintained example and can live with the turbo lag. Performance wise, nothing comes close. (3) White interiors. As you have pointed out, a one and a half day old test drive car had patches of dirt and stains all over. A maintenance nightmare is there ever was one. I disagree. I think the XUV does match the S-Cross. 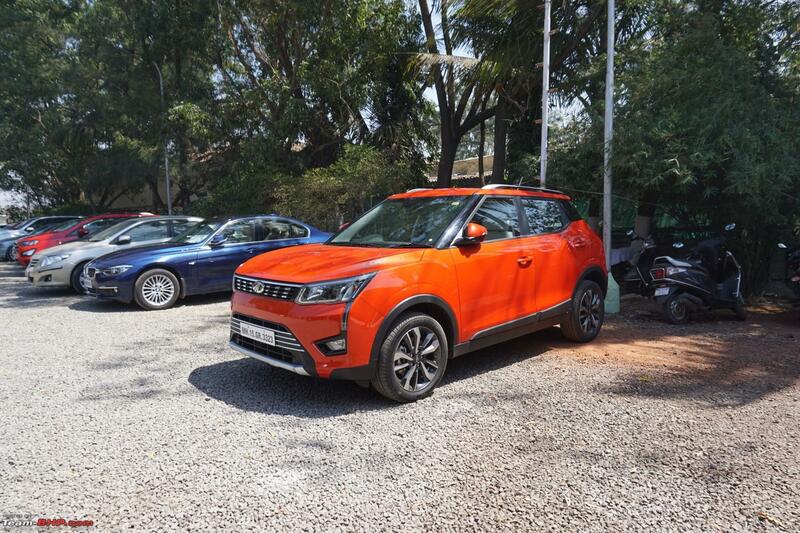 Yes it certainly is very pricey and I'll have to agree, the S-Cross looks much better ( especially the BMW-esque headlamps ), the side profile just looks downright weird for the XUV. But it offers much more features for the money and having driven the 1.3 in it's multiple avatars, I can say I prefer the Marazzo diesel engine. The XUV offers many segment first features that may justify the premium for some buyers, especially ones like me who love a long list of gizmos. By performance, are you referring to the 1.6L turbo Rocket? If yes, then no doubt. Unfortunately, I haven't had the opportunity to drive the 1.6 thoroughly, but from what I've heard, I can safely assume for less than 15 lacs, nothing comes close. If no, then I'm sorry, but I've driven the 1st and 2nd generation swift, the current generation one, the Brezza, the S-Cross and the ciaz and the 1.3L turned out to be just average in each case and certainly did not live upto my expectations. Especially after I drove the i20 diesel. Yes, it was a blast back when the first gen swift diesel was launched, nothing quite came close to the amount of performance and dynamics it offered, but times have changed, but the engine remains the same. Maybe their new in-house diesel will be better. 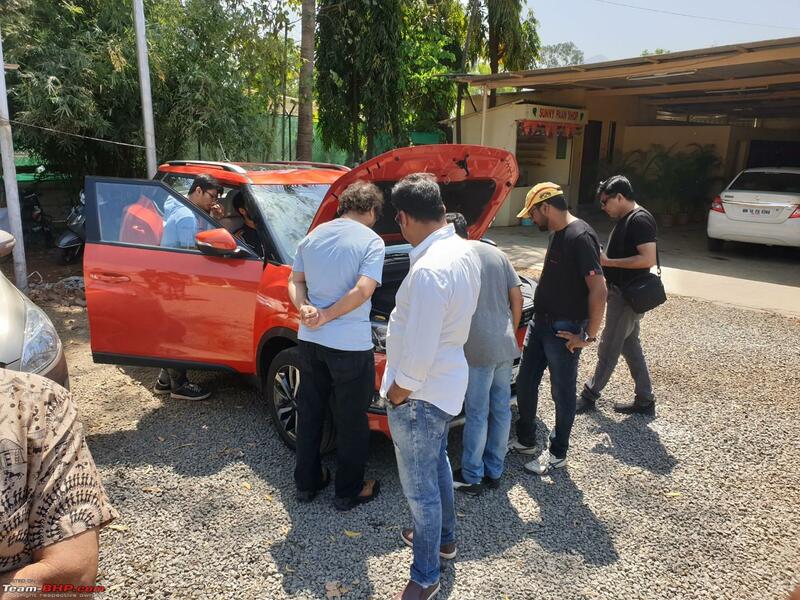 So, we had a big Team-BHP meet @ Lonavla yesterday and I clubbed that with my XUV300 test-drive. Spent the entire day with the car (link to meet thread). City rating = 8.5 / 10. Highway rating = 4 / 10. I really liked the looks & stance of the XUV300. She looked hot in the orange shade of our media car. Sat inside and it felt more like a mini-Creta than a Mahindra (steering wheel is a cut-copy-paste from Hyundai). Top cabin quality and an impressive feature list. The steering is super light in 'comfort mode' & the driver sits tall with a clean view of the road ahead (can see the bonnet too). The turbo-petrol is damn refined for a triple-cylinder. On the move, you simply can't tell its a 3-cylinder. Has good driveability too - it easily passed the 2nd gear speed breaker test, when I dropped the revs to 700 - 800 rpm & the motor pulled without a fuss. Once the turbo starts singing, there is a fun & addictive spike in power and the XUV300 feels quick! The redline is early though and it can catch you out in the middle of an overtaking manouveur (max rpm of ~5,900 only). What mars the driving experience in the city is the l-o-n-g gearshift - too long for this class of car. Also, the brake & accelerator pedals are placed too close to each other (width as well as height). The ride quality is compliant and no owner will complain. I was just thinking what a great job Mahindra has done, but then I reached the expressway. As good as the car is under 100 kmph, it is TERRIBLE over 100 kmph. It's behaviour at 120 kmph is SCARY. I cannot think of any car that I've driven in the last 3 or 4 years with expressway manners poorer than the XUV300. For one, the XUV300 is damn skittish. At 110 kmph, any irregularity (uneven tarmac, crosswinds, bumps) and the car loses composure easily. When coming down the Lonavla ghat, there is a right-hander that I'm taking at 70 kmph. There was a small bump on the road and the rear-left simply lost it, with the tail sliding out (I had to make minor corrections to get it back). Then, I'm cruising at 100 - 120 kmph on the expressway in a straight line. There is a small undulation that won't even affect a Maruti Swift. Get this - the XUV300 moved like 2 feet to the right . I know the Lonavla ghat like the back of my hand and through fast curves that I easily took in the new Santro recently, I had to fight hard to maintain the intended line. ChiragM was in the passenger seat and he said that his Ritz is more planted on the highway. What makes it worse is the steering that is too sensitive at high speed. It results in a twitchy car. I'm surprised this car has even been approved for sale by Mahindra's team as it is too unstable + unpredictable at highway speeds. As things stand today, I cannot recommend the XUV300 to anyone. The suspension is completely unsorted & Mahindra needs to fix this ASAP. We're getting the diesel in the coming week and I will drive that to check if there was any defect in our test car (I doubt it as this is a brand new media car that is otherwise functioning perfectly). Our brand new test car apparently has two defective rear dampers / shock absorbers. The rear-left in particular is worse, I've been told (refer to my earlier comment on the rear-left of the car losing it easily). Mahindra says that a particular batch of dampers was defective and it has issued the TSB that Ph03n!x mentioned to all dealerships. My question to Mahindra was "what about customers who have already taken delivery & don't know that their rear dampers are shot". I'm told that dealers were instructed to check the VIN number of all cars for defective dampers from day 1 itself. I told Mahindra that I appreciate their quick action (a lot has happened in 24 hours). Equally, I'm glad nothing untoward happened while I was driving the car on the expressway!!! This is the first time in my reviewing experience that I've ended up with a defective suspension on the highway. Stuff happens & I understand, but it's still unnerving. If you've bought an XUV300, I would strongly recommend that you call your dealer & check if your car is affected. If they can miss checking out a brand new media car, I wouldn't rule out their missing a customer car either. So, how does a regular XUV300 drive? I frankly don't know. Will be taking another petrol for a spin this weekend. I have asked them to give me the same car with updated shocks. I'm surprised this car has even been approved for sale by Mahindra's team as it is too unstable + unpredictable at highway speeds. As things stand today, I cannot recommend the XUV300 to anyone. The suspension is completely unsorted & Mahindra needs to fix this ASAP. Such a relief that we still believe in reviewing a car on its merits and demerits alone. This has to be the first review of the car which is so critical of it ( and I have no doubt it is true). All the reviews online till now have been singing only praises. Senior reviewers whom I have admired since long, such as SVP, have fallen prey to the ad revenue malice too I guess. Waiting for the official review now. 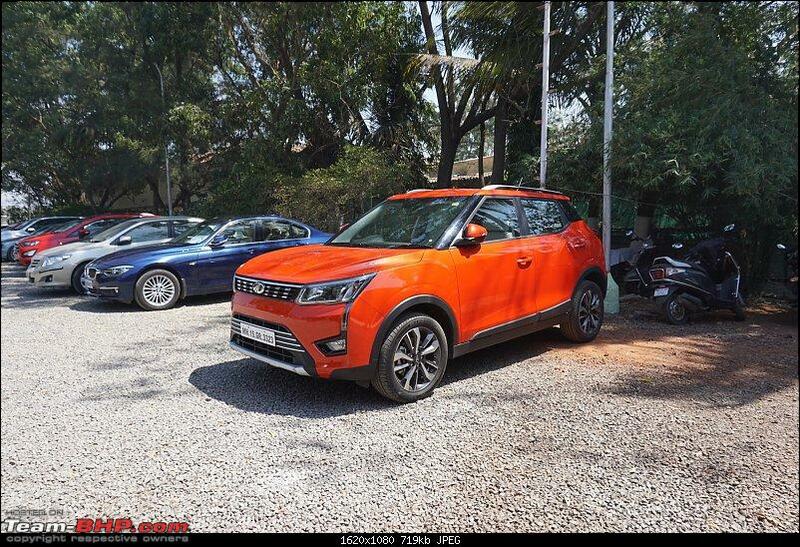 I'm surprised this car has even been approved for sale by Mahindra's team as it is too unstable + unpredictable at highway speeds. As things stand today, I cannot recommend the XUV300 to anyone. That's a huge blunder, GTO. After the Marazzo, I expected Mahindra to up the game. Would there have a change in the suspension from the Tivoli that it's based on? This is probably one of the first times I have heard a verdict from you before the official review came out. The long gear throw, I guess is an XUV trademark - transferring the legacy from the XUV500. And I don't understand why the pedals positions can't be standardised. I've never felt this in, say, all Suzukis or Hondas that I've driven. In the Santro Xing, there was this weird issue of wider shoes eg. Safety shoes getting stuck between the brake and clutch pedals. was a small bump on the road and the rear-left simply lost it, with the tail sliding out (I had to make minor corrections to get it back). There is a small undulation that won't even affect a Maruti Swift. Get this - the TUV300 moved like 2 feet to the right What makes it worse is the steering that is too sensitive at high speed. It results in a twitchy car. Fingers crossed till you test the diesel; but I think the chopped and light rear has got something to do with this. This is one hugely disproportionate car. Last edited by vigsom : 3rd March 2019 at 08:24. All the reviews online till now have been singing only praises. Now you know why we insist on getting the car in Bombay for a full test. Driving it over 4 - 5 days in conditions we're familiar with lends the true picture. After the Marazzo, I expected Mahindra to up the game. Exactly what I was telling the gang at the Team-BHP meet yesterday. The Marazzo was so sorted, and the XUV500 is no slouch. I'm frankly shocked at how they've goofed up with the XUV300. It's a disaster on the expressway. Would there have a change in the suspension from the Tivoli that it's based on? I haven't done my full research yet, but yes, I do believe that the XUV300 rides taller than the Tivoli and hence, suspension changes are a given. Now, I'm eagerly waiting to drive the diesel variant to see if it behaves the same (I'm 90% sure it will). This is where our reviews add value; mainstream media is so watered down that negatives are either hidden or carefully worded as positive, to promote the product. One example below - a shootout which was a like whodunit movie, with the suspense already revealed in the first frame itself. a I was just thinking what a great job Mahindra has done, but then I reached the expressway. As good as the car is under 100 kmph, it is TERRIBLE over 100 kmph. It's behaviour at 120 kmph is SCARY. This is quite scary to hear. I had test driven the xuv 300 diesel a few days ago. In kerala, highway speed limit is 80 kmph. I did drive uptp speeds of 100 kmph. Eventually the police stopped me and had to pay 400 rs fine for over speeding. But uptil speeds of 100 kmph, i was quite impressed at how stable and planted the car felt. Any conjecture on why the vehicle stability goes for a toss above 100 kmph. What specifically in the suspension may be causing this? Any car handles well at lower speeds. Even the Maruti Alto K10 - with its basic and cheap suspension - is okay under 90 kmph. It's high speed behaviour that separates the good suspensions from bad. Still it was too surprising to know the multiple personality disorder of XUV3OO suspension tuning. In almost all the reviews, the suspension tuning is praised like never before for a Mahindra. Looks like XUV3OO is well adapted for Kerala conditions as our maximum highway speed limit is 90kmph . Last edited by pavi : 3rd March 2019 at 10:10. Me too, waiting for your next review. I am in the booked and holding persons category after the price shock. Tivoli ground clearance is 167mm and XUV300 is 180mm. 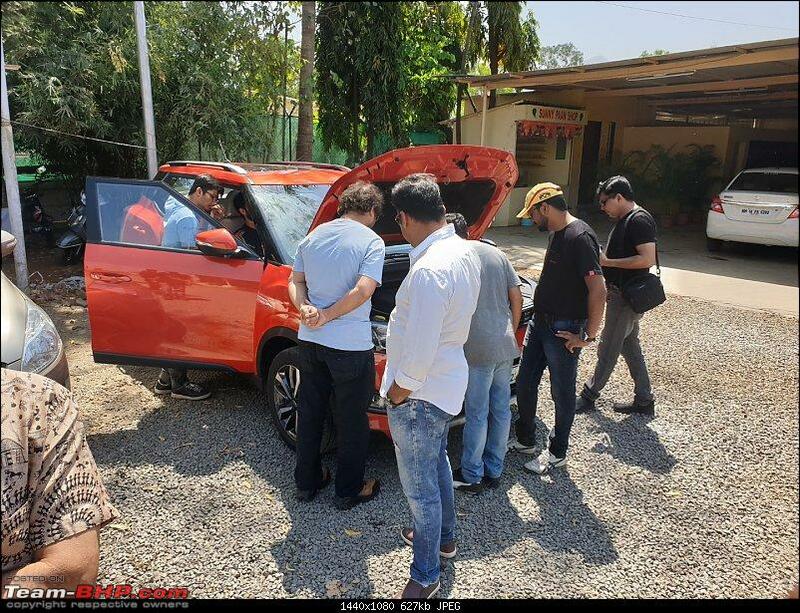 I guess, a combination of raised ground clearance by 13mm, chopped rear by 20mm and suspension tuning to suit Indian conditions might be playing spoil sport. But, what about Gaurav Gill? Did you check the Tyre pressure on the on-board TPMS?